What’s Wrong with the New Conservative History? 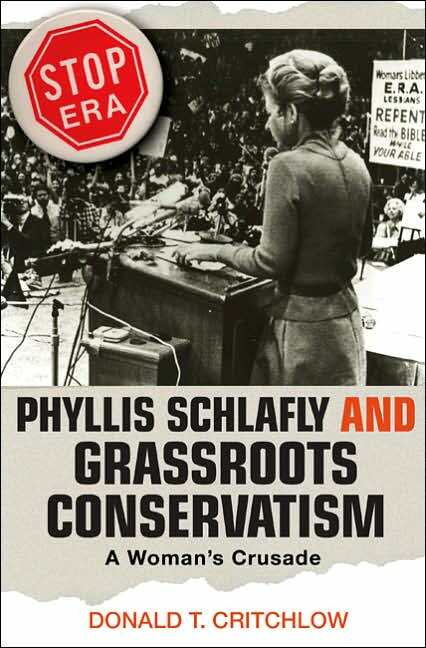 Mr. Critchlow is a professor of History at Saint Louis University and author of Phyllis Schlafly and Grassroots Conservatism (Princeton University Press, 2005) and The Conservative Ascendancy: How the GOP Right Made Political History, which will be published this November 2007. In the decade since Alan Brinkley and Leo Ribuffo issued their call for scholars to examine the history of conservatism, a plethora of monographs have appeared exploring the history of the Right in America. In the next few years we will see many more books and articles appearing—far too many to mention in passing. Given this large body of literature that continues to grow, perhaps we should stop and take measure of where we are headed. In this regard, I want to make two brief points in order to spur discussion: First, I do not believe enough attention has been given to framing the history of conservatism more broadly within the context of modern liberalism. Second, we need to stop seeing the rightward shift in the electorate in the late twentieth century as simply a racial backlash. Both points suggest that many historians working in this field simply are not getting the full story. Let’s turn to the first point: To understand the rise of the Right in postwar America we need to have a better understanding of liberalism. We know a lot about civil rights protest, civil rights leaders, various aspects of the feminist movement, unions and organizing campaigns in the postwar period. What we know less about is the role that liberal activists played in the Democratic party from primary campaigns, general elections, lobbying, and policy outcomes. We know little about large financial contributors who supported liberal candidates and who pushed liberal causes. We know more about conservatism and these kinds of issues than we do about liberalism. The rise of conservatism can only be understood in light of liberalism. While historians have discussed the decline of the New Deal political coalition, much of this discussion has been given to the specifics of this break-up (often from a perspective of what could have been done to have sustained the progressive agenda). This is to say that more attention has been given to the political and ideological aspects of the breakup of the New Deal coalition than with the larger economic and social context that led to the breakup. The New Deal political coalition was premised on an industrial society composed of a unionized workforce earning high wages and benefits. A welfare system was designed to take care of citizens unable to work, and farmers were provided with subsidies and price supports. This political program was constrained by the Southern wing of the Democratic party. As a consequence liberals failed to enact national health insurance and failed to guarantee voting and civil rights for African Americans in the segregated South during the New Deal and Fair Deal periods. In post-World War II America, the economy moved from an industrial basis to a post-industrial economy that undermined the New Deal liberal vision of a good society. In this economic transformation the American workforce became more white collar and less unionized. As the economy shifted to more high tech and service jobs, employers, burdened by alarming increases in local taxes and government regulation, left Eastern cities for more favorable business environments in the Sunbelt. Deteriorating conditions in industrial East and Midwest , racial tensions, and opportunities for a better life led people to move to the suburbs and to the Sunbelt. In the late 20th century, society underwent profound changes. The family was transformed as more women became college educated and developed professional careers. Marriage ages increased; family size decreased, and divorce rates went up. The suburbanization of America, changing family structures, and a service economy pulled voters toward the Republican party’s political agenda of low taxes, strong national defense, and traditional social values. The New Deal’s political agenda based on an industrial society seemed antiquated to many voters living in the expansive Sunbelt. In 1970s, anxieties caused by changes in traditional families—and the move by the left to promote secular values and gender issues—pushed many middle class white voters to the GOP. The globalized economy intensified acute social and racial tensions within American society. Demands for racial, social, and political integration met with resistance, varying in intensity and form in both the South and the North. Racial tensions set a context for the rise of the GOP Right, but it is not the entire story. Historians writing on modern conservatism and the rise of the GOP right in the late twentieth century need to move beyond a story of racial backlash. This view is too one dimensional and reflects, in my opinion, intellectual laziness because it oversimplifies the dynamics of basic social change, an increasingly mobile society, and changing technologies. The transformation of the South into a Republican stronghold had already begun on the presidential level in the 1950s, followed by a shift on the district level in statewide races in the 1960s. This shift was gradual and began in the suburbs. Worth noting is that from 1903 to 1960, there were no Republican Senators from any of the eleven Old Confederate states. In 1961, John Tower won a special election in Texas as a Republican. More importantly, a decisive class shift occurred in voting patterns among Southern voters in the post-1960 period. Prior to 1960, the Democratic vote was drawn from the upper income groups, while those few Republican votes came from lower income groups. After 1960, upper income groups switched to the Republican party. This coincided with demographic changes in the South, particularly the tremendous growth of suburbs outside of major Southern cities and the large influx of northerners to the South. These suburban voters were concerned with issues such as low taxes, anti-unionism, and family values, and they moved into the Republican party. As political scientists Byron Shafer and Richard Johnston demonstrate in The End of Southern Exceptionalism: Class, Race, and Partisan Change in the Postwar South, it was economics, not race that won the South for the Republicans. The burgeoning suburban middle classes went Republican in 1980, and the elections which followed, because of promises of tax cuts and a smaller federal government. Especially interesting in this regard was the pattern of voting for Democratic presidential candidates, George Wallace in 1968 and Jimmy Carter in 1976 and 1980. In 1976, when Carter first ran for President, he picked up majorities in 79 percent of the districts in the South that had voted for Wallace in 1968, while picking up majorities in only 59 percent of the districts in the South that went for Nixon in 1968. In the 1980 election, when Ronald Reagan swept the South, the majority of those districts that voted for Carter were those that had voted for Wallace in 1968. This suggests that Wallace was not a bridge-candidate for white voters in the South into the Republican party. The rise of conservatism in America tells a larger comparative story. Contrary to social science predictions in the 1950s that the United States would become more like European countries--social democratic and secular--Americans have remained nationalistic, patriotic and religious. This apparent American exceptionalism needs to be explained more fully. Framing the history of conservatism only in terms of racial or corporate self-interest keeps our understanding of conservatism incomplete—and sometimes just plain wrong. When you read the political debates of the 1880s and 1890s they sound very much like something you could have heard in the U. S. Senate last week. It is the same old crap about the "rich" and the "poor," with the latter being on the side of the angels. The central question of the 20th century is why didn't the Red Revolution win? Have-nots were always more numerous than haves, and they were several times whipped into a frenzy by people like FDR and Harry Truman. FDR came along in 1933 with the same "working man" and "malefactors of great wealth" nonsense, ostensibly designed to put his "little man" in the saddle, and these arguments hardly changed in the Democratic Party right through John Kerry to the present day. Hard leftists will point out that most leaders on both sides are today very wealthy, e.g., John Kerry, who married Heinz ketchup, Herb Kohl, whose cash registers ring and ring and ring, or Jay Rocekeffer, whose oil wells pump and pump, and Ted Kennedy, Diane Feinstein, and many others. So there is a school which believes the "little man" is sold out(in the clutch, behind closed doors) by such people, but that is not a view held by many. The fact is those purporting to speak for the have-nots simply haven't made the sale. We are told the net worth gap is growing, not closing. But the silent majority LIKES to live in "the land of opportunity." I think the voters have become convinced that socialism, while it sounds good, does not work in practice. They are thoroughly disgusted with the reduced efficiency of public compared to private institutions. You also have a vast contentment among the enormous middle class, which seldom sees any reason to upset the status quo. People know they "have it good" in this country, which is, after all, the only country on earth with borders which millions of people sneak past each year. You can bad-mouth the U.S. all you please, but every time the question is put to a vote by those who vote with their feet, the U.S. wins by a landslide. There is economic mobility, as well, and millions of the "exploited workers" from yesterday are among America's biggest plutocrats. Somehow, the system created by Hamilton and Madison still works extremely well. I think a big key is the property rights protections. When you have three cars, a second house in the woods and a large boat, having started with nothing more than your bare hands on an assembly line, you are not very interested in revolution. This could be why the hard left continues to attack property rights so assiduously, hoping to overthrow the "takings clause," and other property protections, by appointing federal judges who will usurp legislative powers. So far, thank God, the majority has barely kept them in check, and the issue has been brought to public attention forcefully in the first decade of the 21st century. Both sides, those who love the old Constitution and those who would change it, both know that property rights is the crucial battleground. note - please excuse the absence of capital letters; my keyboard is malfunctioning. in answering the question where did the conservative right come from, the usual plethora of responses miss the point. in fact, the question itself suggests that the conservative right represents something new. the better question is what galvanized formerly apathetic religious and cultural conservatives to become political? here, the answer rests in the extremism of counter-cultural rebellion. but this only initiated the process of politicizing the silent majority. the real impetus were culturally and socially far-left court decisions that did not so much go to far ahead as they did too far astray. further, these court decisions imposed a minority social and cultural position on americans and robbed them of using the mechanism of democratic government in order to prtoect their social and cultural values. unlike civil rights cases which are clearly constistent with the constitution, the roe case simply created rights that did not exist and have no constitutional basis. the religious right was content with state governments that regulated abortions and reproductive matters in the interest of protecting the lives of unborn children to varying degrees. roe v. wade imposed the vision of majorities from pro-abortion states on the nation as a whole. in addition, criminal rights helped galvanize the populist right as well. really, the populist right is really what it says it is: a fight for democratic governance within the context of liberties protected by the constitution. it is, in fact, a rebellion against elites - in particular the courts- who imposed diktats that have no sound constitutional basis and are thus, in point of fact, arbitrary and outside the bounds of objective law. to call the religious and cultural right extreme is to ignore that it is the liberal courts that are extreme - and it is only in the courts that radical social and cultural liberalism can survive. this also connects to the decline of the new deal coalition. the so-called reagan democrats were not working class people brainwashed into foillowing their capitalist oppressors. they were true new dealers - religiously and culturally conservative- who abandonded the new democratic party of bohemian upper-middle class radicalism. last, the conventional wisdom that cultural and social issues are red herrings used by capitalists to fool workers into voting against their own economic interests is bull. if these issues were so insignificant, then you would think the democratic party would abandon them - it is not the republicans who are obsessed with social annd cultural issues, it is the democrats - and they're obsessions do not reflect majority opinion and probably never will. if the democrats want to focus on economic issues and win back the reagan democrats, then why don't they concede roe v. wade and affirmative action? because they can't, as those are the issues of the greatest import to the base of the party. (Please ignore the last message, which my Robot software pasted in from the last time I was at HNN!). Liberalism/New Deal coalition: "What went wrong?" Consevatism: "What went wrong?" (What IS it with those people in Kansas?!). "More importantly, a decisive class shift occurred in voting patterns among Southern voters in the post-1960 period. Prior to 1960, the Democratic vote was drawn from the upper income groups, while those few Republican votes came from lower income groups." Are you speaking of WHITE southerners? All southerners? If Eisenhower and Nixon got 25-30% of the black vote, much of it was still in the South (recall MLK's father was a Republican). I agree with Dr. Critchlow that the causes of the switch from Great Society liberalism to neo-conservatism are more complex than many historians make them seem. I would add that we also need to distinguish between the various elements that make up the neo-conservative coalition. I would break it down into 3 categories: religious conservatives (concerned about perceived moral issues such as abortion, homosexuality, etc. ), social conservatives (frustrated with rising tax burdens to pay for gov't programs that don't benefit them) and economic conservatives (longing for a return to laissez-faire). For all the hand-wringing about the supposed triumph of the religious right, it has actually been the economic conservatives who have dominated the neo-conservative coalition over the past 25 years. In some ways, the current Republican party is reminiscent of the old division between the Conscience and Cotton Whigs.